Hemp. Dates. Bites. BAM! 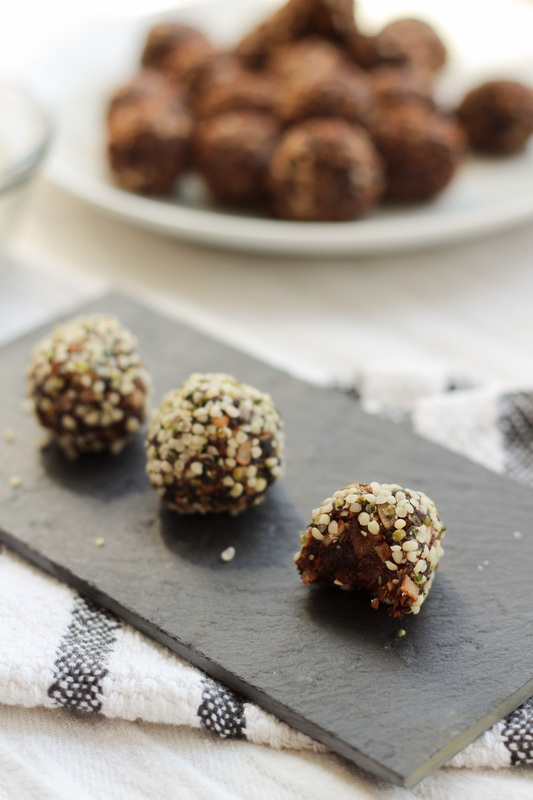 Vegan, healthy, sweet, nutty, flavourful, quick, no bake. Can you resist? I don’t think you need more reasons to give it a try? Also, hemp seeds are my new obsession! Eating a salad? Add some hemp. A yogurt? Let’s sprinkle some hemp. Snacking on a banana? Dip it in some hemp. The nutty taste is the perfect addition to my meal or snack? Have you tried them yet? The idea of using the sweetness of the dates, the flavour of the coconut and the aroma of the prune materialize quickly into this yummy snacks. I wanted to prepare some small bites to satisfy my cravings, I had to keep in mind that my work is a nut-free environment. Naturally, hemp seeds came to my mind since you can get the nutty taste and respecting the rules. That’s my main argument here for this hemp dates bite size. The preparation is easy, you toss it all in the food processor and shape the little balls. Just roll them in the hemp seeds and voilà! 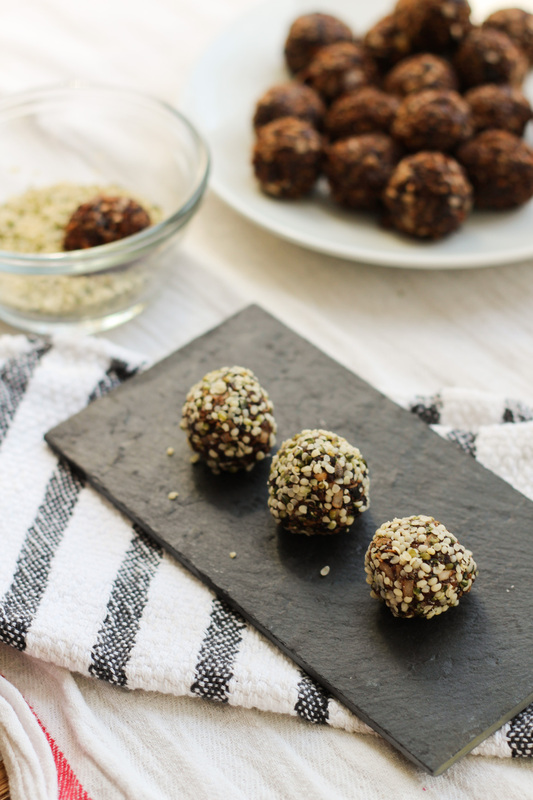 You’ll love the sweetness from the dates and I’m totally addicted to the nutty flavor of the hemp. Did I mention it already? Also, no bake recipe! No. Bake. Basically, in 15 minutes you could have this beauties ready and your kitchen tidy. I don’t know about you but I love that feeling when you prepare something yummy and you clean up your counter, do the dishes and it’s all neat and enjoyable. I know I’m a little obsessed sometimes eheh! Keep it in a air-tight container and you can save these energy bites 3-4 days if they last that long without being eaten. It’s the perfect snack after a work out or the after lunch sugar craving. Hello dates! SCHOOL SAFE. Did I catch your attention? It’s taste somewhat nutty but there isn’t any! Get your kids to help prepare it with you and then be the taste tester! Also, since the mess is minimal, getting the kids in the kitchen is totally doable. I’m working of having them involved more often because I’m guilty as charged! I do try to involve them in prepping and cooking but it’s easier said than done. 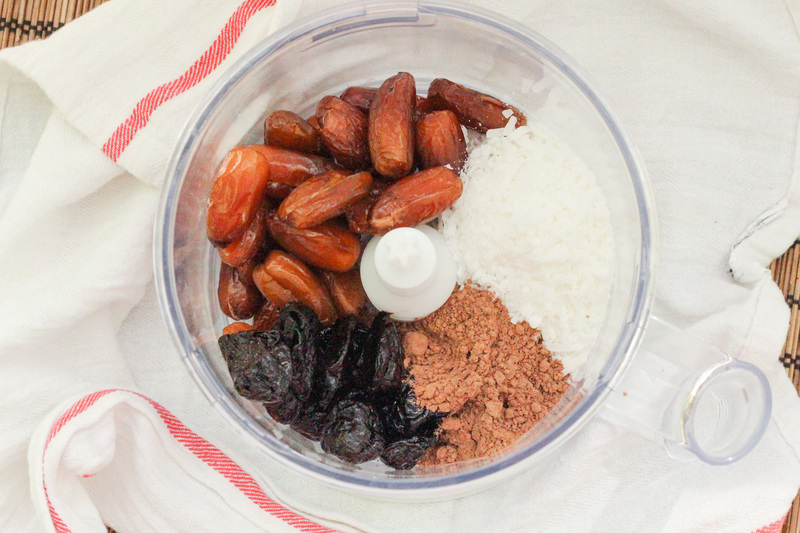 - Place the dates, prunes, shredded coconut and cocoa powder in a food processor. Mix until well blended. - Shape small balls with your hands until all the mixture is used. - Roll them in the hemp seeds. - Store in a air-tight container. 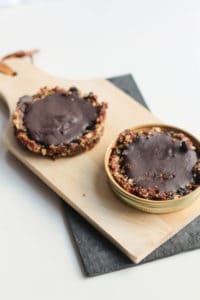 And if this is your kind of snack, you should give a chance to this vegan chocolate tartelettes, they are to die for! So good that you would not believe this is good for you! 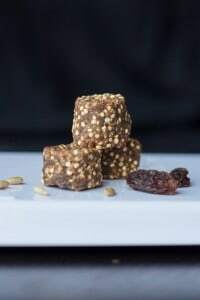 Or also, how about this quinoa energy bites? 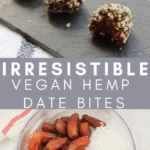 I love date energy bites and I love hemp seeds! But I never thought to roll my energy bites in hemp seeds. Brilliant! I’ll definitely be giving that a try. Happy weekend! J’adore les energy bites! Mais je n’en ai jamais fait avec des prunes séchées ni avec des graines de chanvre. Le mélange doit être délicieux! Je vais essayer c’est certain! Merci! All healthy and my favourite ingredients you have used in this recipe, I want to taste now, this is really irresistible bites..